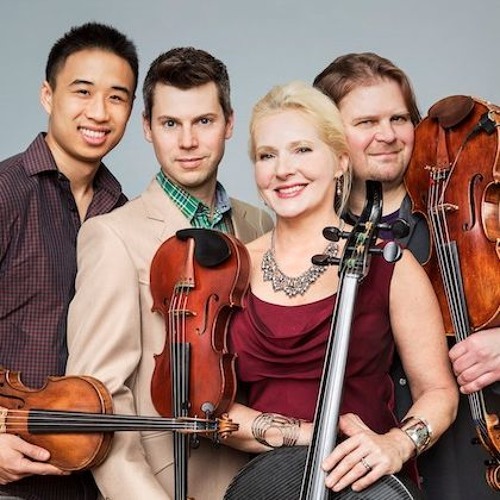 Described as “indefatigable and eclectic” (The New York Times) and “vital and brilliant” (The New Yorker), the string quartet ETHEL continues to be a pacesetter of post-classical music. Formed in 1998, the New York City-based ETHEL comprises Ralph Farris (viola), Dorothy Lawson (cello), Kip Jones (violin) and Tema Watstein (violin). ETHEL performs adventurous music by celebrated contemporary composers such as Julia Wolfe, Phil Kline, David Lang, John King, Raz Mesinai, John Zorn, Steve Reich, Kenji Bunch, JacobTV, Don Byron, Marcelo Zarvos, Evan Ziporyn and Mary Ellen Childs. Upcoming highlights for the 2012-13 season include: a concert tour of the Netherlands; a week-long workshop/performance of “ETHEL’s Documerica” at New York City’s Park Avenue Armory; and nationwide tours of “Tell Me Something Good” with rock icon Todd Rundgren, of “Music of the Sun” with Native American flutist Robert Mirabal, and of “And Other Stories...” with guitarist Kaki King. ETHEL currently serves as the Ensemble-in-Residence at the Grand Canyon Music Festival as part of the Native American Composers Apprenticeship Project, the official house band of TEDxManhattan, and more. For more information, please visit http://www.ethelcentral.org.